*Note: All reservations must be received prior to doors opening on day of the event to ensure response time. Limited availability. *Note: All guest list must be received by 8:30pm day of the event. 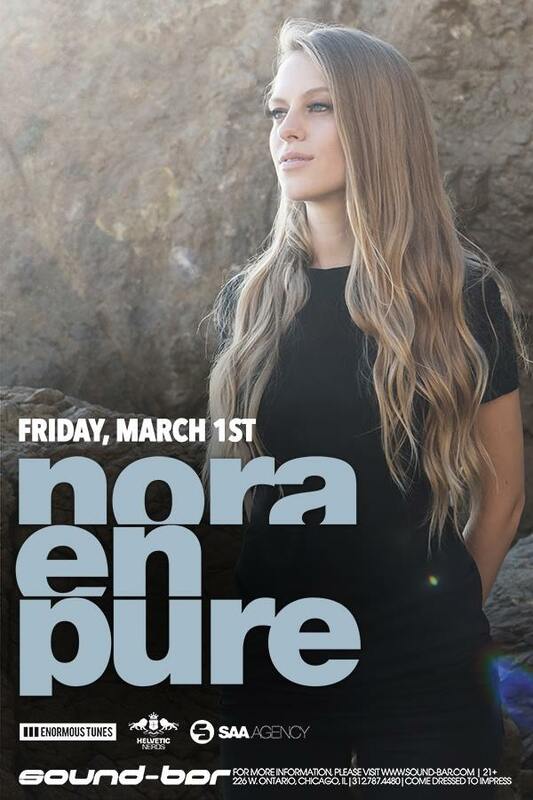 Sound-Bar is proud to welcome in her sound-bar debut, Nora en Pure! A core member of the Helvetic Nerds group, Nora leads listeners out of the darker realms of deep house with intricate instrumentals and enlightening melodies. Every track she gets her hands on turns to gold and every performance she gives leaves the audience in awe. Gracing the decks of some of the most revered dance music spots over the years, Nora has played sets at the likes of Ultra Music Festival, Coachella, Tomorrowland, Ushuaïa Ibiza, Mysteryland USA and held residencies at the world’s largest club Privilege Ibiza and Marquee Dayclub Las Vegas. Touring relentlessly all over the globe to bring her scintillating sound to as many countries as humanly possible, her loyal and ever-growing fan base is scattered all across the planet. Meeting many career milestones over the past two years, 2016 saw Daniela deliver her breathtaking BBC Radio 1 Essential Mix. In 2017 she delivered a long list of sensational releases, including her diverse 4-track ‘Conquer Yosemite’ EP, funk-driven cuts ‘Waves’ and ‘Fever’, and touching creations ‘Tears In Your Eyes’ and ‘Trailblazer’. Making her debut at Coachella and being the only female artist to play Tomorrowland’s Mainstage Daybreak Session, she closed the year on an all-time high.